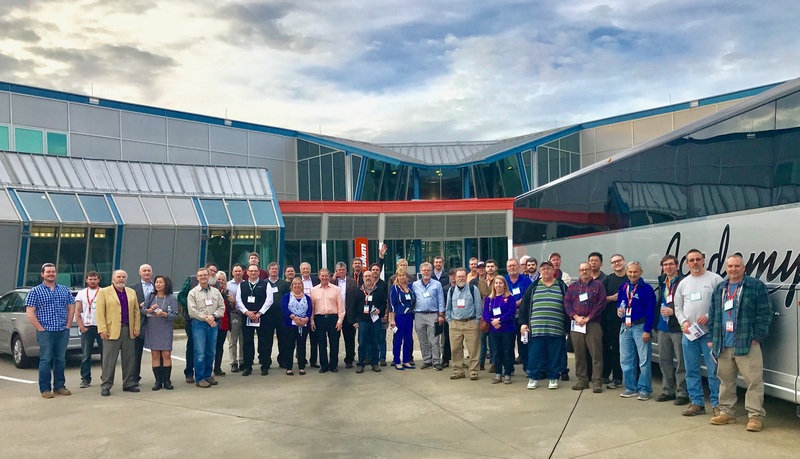 Vollmer of America recently hosted a three day event at their Carnegie, Pennsylvania location focused on PCD technology. This event was modeled after a similar event that was held at the company’s corporate headquarters in Biberach, Germany. Demonstrations of new machine technology along with guest speakers from the major PCD suppliers generated excitement and great dialogue throughout the week. Arndt Hauger, PCD Product Manager, and Alexander Schmid, PCD Technician, from Biberach, Germany were both present to highlight some of the latest Vollmer technology to the attendees. A fully automated QXD250 machine was demonstrated to highlight the new erosion capabilities and explain various machine options for the processing of PCD drills. The QWD750H machine also was demonstrated to highlight the machine’s flexibility for producing PCD tools for the automotive industry, as well as standard PCD tools. In addition to the hands on machine demonstrations, Arndt presented information to the group regarding the ability to process drills and end mills utilizing the cylindrical erosion program that is now capable with finishes of 0.1µRa, and the speed improvements that permit finishing tools in 30% less time than the QXD200. Thursday was the focal point of the week as speakers representing Zoller, Element Six, Iljin, Gerling and Haimer discussed specific items of interest to the attendees. Over 50 attendees from 21 companies were on hand to see the demonstrations and hear the various speakers. Michael Stepke of Zoller began the presentations discussing current trends that Zoller has seen in measurement requirements at various end users and tool producers. Michael also shared some of the methods and solutions that Zoller has introduced to make tool manufacture and resharpening more efficient. Stephen Kelly of Element Six was the next speaker and discussed the V-tec end mill in great detail. This PCD configuration continues to show great promise in many aerospace applications as the braze joint is removed from the heat zone allowing the tool to be run at increased speeds and feeds when compared to standard planar PCD designs. Lunch was followed with a presentation by Matt Collier of Element Six. Matt discussed some of the newer ultra fine grain materials. These PCD sizes have been shown to result in sharper edges and longer tool life in many applications. Brendt Holden of Haimer spoke next and shared great details concerning the benefits of correct balancing techniques for the tool fabricator, how it impacts the finish operation and how the specifications are typically chosen. Dr. Heesub Park of Iljin followed with a presentation on PCBN materials. PCBN continues to be an area of huge potential growth for the tool producers in a wide assortment of ferrous applications. Dr. Park shared many case studies of the various grades of materials detailing how they reacted in each application. Brian Haas of HMT Machine Tools represented Gerling, and shared information with the group regarding the various types of brazing for these materials, things to look for in the braze process, and in the finished braze joint. Gerling, Zoller and Haimer also had machines installed on site for demonstrations throughout the three days. Several other manufacturers were also on hand to discuss materials and tool processing with the attendees. Dave Simpson represented Worldwide Superabrasives, Todd DenBoer represented Big Sky EDM, and Donna Steele of Tigra provided information for the attendees. Many positive comments have been received from the attendees concerning the agenda that was in place and several mentioned how nice it was to be able to interact with all of the PCD manufacturers in one location. Multiple attendees have requested that Vollmer conduct more seminars that also address more advanced applications and processes.